Ray Charles Robinson was born in Albany, Georgia on September 23, 1930. Also known as the “Father of Soul”, Ray helped kickstart the beginning of a new genre of music, known as “Soul”. Ray moved with his mother to Greenville, Florida when he was an infant. Something very troubling happened during his childhood that he would carry with him for the rest of his life. When he was only 5, he had witnessed his 4 year old little brother, George, die from drowning in his mother’s washtub. Soon after that, Ray began to lose his sight. By the age of 7, he was completely blind, as a result of Glaucoma. His mother sent him to the Florida School For The Deaf and The Blind in Saint Augustine, Florida from 1937 to 1945. There, he learned to read, write and even compose music in braille. He also learned to play many instruments like piano, the organ, the saxophone, the clarinet and the trumpet. You could say that getting this well-rounded education really helped to get Ray into music. He enjoyed everything from country to gospel. Ray’s mother, Aretha Robinson, died when Ray was 15 years old. After that, he toured for a year on the “Chitlin’ Circuit” in the south. It was during this time that Ray began using Heroin. At the age of 16, Ray moved to Seattle where he met long-time friend, Quincy Jones. He began performing with the McSon Trio in the 1940’s. Early in his career, his style resembled that of his role models, Nat King Cole and Charles Brown. In 1953, he released his first single with the Maxin Trio called “Confession Blues”. He did well on the R&B charts and by 1953, Ray Charles got signed with Atlantic Records. His first hit single with the label was “Mess Around”, truly a classic of that era. His Fusion of Gospel and R&B created a whole new genre of music; Soul. Because of his love of heroin and his overall temperament, his live performances were inconsistent. However, since he was such a great musician and because his audience loved him so, Atlantic Records decided to record two of his live performances; Ray Charles at Newport Jazz Festival, and Ray Charles In-Person. 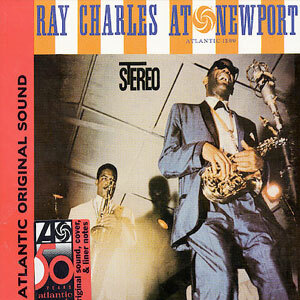 Ray Charles at Newport is a classic record. It’s raw and it’s soulful. You can hear from the recording that the audience loved it by their applause and exclamations. It was pointed out that most of the people there hadn’t heard of Ray yet since his popularity had only just begun. Recorded on July 5, 1958 in Newport, Rhode Island at the Newport Jazz Festival, Ray Charles at Newport shows the soul and passion that used to go into the making of music. Because this record was recorded from a live show, you can begin to understand Ray and the influential meaning behind his music. Ray’s raw, musical, and excited nature created such an image for his fans that there’s no doubt that his legacy will continue for many years to come.